What a fun, hip place to stay at while vacationing in the Caribbean. Sugar Cane Ridge is located in the Royal Westmoreland Golf resort, perfect for the golf lover though all will fall in love with this spectacular home. You will feel invigorated just walking through this beautifully decorated home. All three bedrooms are white with a splash of island color. On the bottom floor, you can simply walk out your bedroom doors and enjoy taking a dip in the refreshing pool. Upstairs, you can walk out onto your own covered balcony and take in the beautiful view of Barbados’ blue Caribbean waters. You can also sit at the dining table, which accommodates eight, and enjoy the same view through the large glass doors that open up onto the balcony. When you are ready to enjoy the ocean you can use the convenient Beach club shuttle service which will take you to Mullins beach where you can soak in the sun or choose to snorkel with the colorful sea life that inhabits Barbados’ waters. Amazing views to Barbados western coastline and the Caribbean Sea beyond! 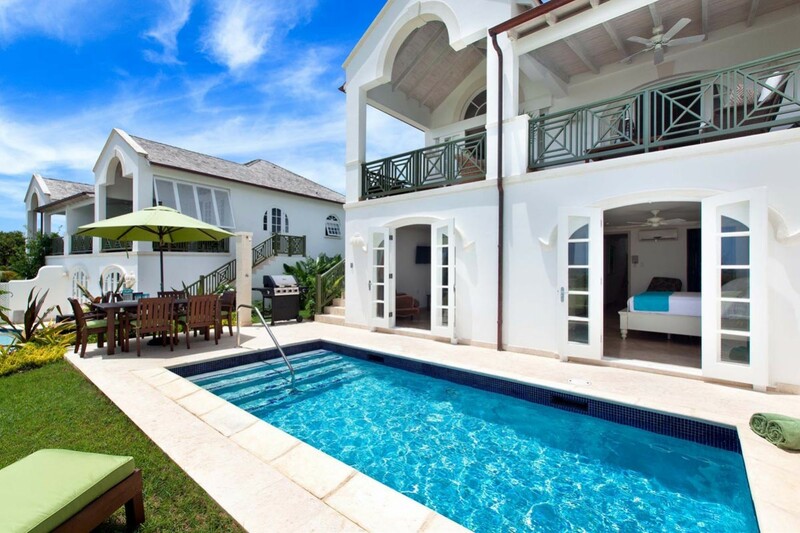 Sugar Cane Ridge #2 - Coral Blu is a bright and airy Caribbean villa, nestled in the exclusive Royal Westmoreland Golf Resort in Barbados. This modern tri-level holiday home features 3 comfortable and tastefully decorated bedrooms, all of which include their own en-suite facilities. The Master bedroom and Second bedroom both open on to the pool deck which is located on the lower level of the villa. It’s the perfect spot to sunbathe or enjoy a cooling dip in the private plunge pool with amazing views to Barbados’s western coastline and the Caribbean Sea beyond. The open plan living and dining area can be found on the upper level of this holiday rental villa, leading out to a spacious covered balcony where guests can relax and enjoy the stunning panoramic ocean views and tropical sunsets. The modern kitchen is well equipped, with everything at your fingertips to make your holiday relaxed and enjoyable. There is also a barbeque on the pool deck for delicious dinners under the stars! The third bedroom featuring cool white and fresh green accents is located off of the main entrance which leads up to the main living level. All holiday guests at Coral Blu benefit from the exclusive Royal Westmoreland Beach Club located five minutes away from the enchanting Mullins Bay. Effortlessly trade your pool and deck for the soft sands and blue waters of Mullins Beach - a favorite for many Barbados visitors. Choose to snorkel or swim with vibrant tropical fish and turtles or relax in the warm Barbados sun. Services of the Beach Club include free shuttle service to Mullins Beach as well as Bell Captain beach services. The Royal Westmoreland Golf Resort blends privacy, luxury and superior service. The community is home to a world-renowned, five-star golf course offering magnificent views of the Caribbean Sea from every green. Exceptionally located on the West Coast of Barbados the resort attracts many high profile personalities from around the world. Royal Westmoreland enjoys 24-hour security and holiday guests have access to the golf course, tennis courts, fitness center and clubhouse with a resort pool, varied dining options and the beach facility. Golf, tennis and spa treatments can be arranged as well as restaurant recommendations and bookings for the many excellent dining options on the island. Just ask your wheretostay.com representative - they’re ready to help! Our stay at Sugar Cane Ridge - Coral Blu was terrific. The amenities were all top of the line and just as advertised. Better still, we were the beneficiaries of a housekeeper who, amongst other things, did our laundry every day, and a cook who prepared two delicious meals for us every day. The location near Holetown made it all the more convenient to indulge in some of the best that Barbados has to offer in nightlife and entertainment. Equally so, Coral Blu was situated within the Royal Westmoreland development, which offered a whole slew of benefits from concierge service, golf and tennis facilities, a gym, a pool, and dining establishments. We were thrilled with our choice of villa, and really felt like it was a home away from home. The experience with WhereToStay.com could not have been better. We were late in the process when we first came across the site. Despite it being the heavy holiday season, Andrew was extremely helpful in helping us identify the right property. Before allowing us to confirm the property, he checked his local sources to be certain there was no construction in the area that might impact our experience. He secured a rental car for us and gave us a slew of activities to choose from in advance. Most impressive of all, when the flu delayed our start to the vacation, Andrew discussed with the homeowner and was able to get us an extra couple days. He truly went above and beyond our expectations and we could not give him a stronger endorsement. 20% Off Construction Discount in Summer! - Valid on new bookings only and cannot be combined with other offers. Get 2 Free Tee Times!! Book a minimum 7 night stay and get 2-tee times at Royal Westmoreland free!! Good for stays from Jun 21, 2018 to May 31, 2019.